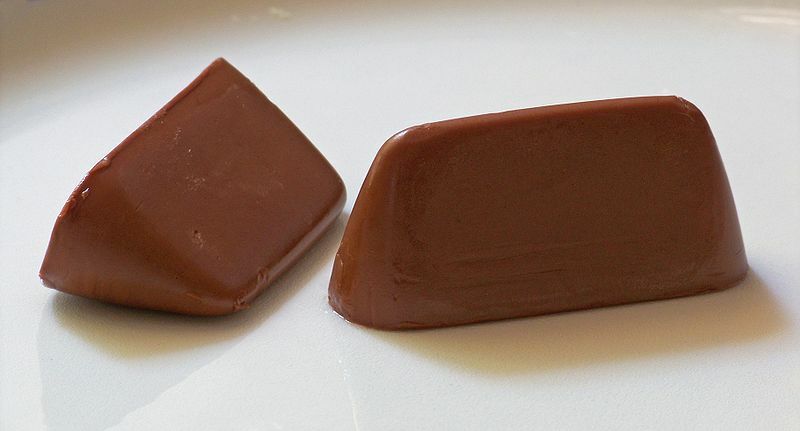 The Gianduiotto is a Piedmontese chocolate whose shape is similar to an upturned boat. Gianduiotti are individually wrapped in a tinfoil cover, usually gold or silver-colored. It is the speciality of Turin, and takes its name from Gianduja, a mask in commedia dell'arte that represents the archetypal Piedmontese. Gianduiotti are produced from a paste of sugar, cocoa and hazelnuts. The official “birth” of Gianduiotti is set at 1865 in Turin, by Paul Caffarel and Michele Prochet (owners of the company now named Caffarel Spa), the first to completely grind hazelnuts to a paste before adding them to the cocoa and sugar mix.